OSWEGO, NY – The Oswego County Legislature’s Economic Development and Planning Committee presented a certificate of recognition to students from Pulaski High School as the winning team of the 2014 Oswego County Envirothon. This high school competition tests students’ knowledge of natural resources with hands-on exercises in aquatics, environmental issues, forestry, soils, and wildlife as well as an oral presentation. 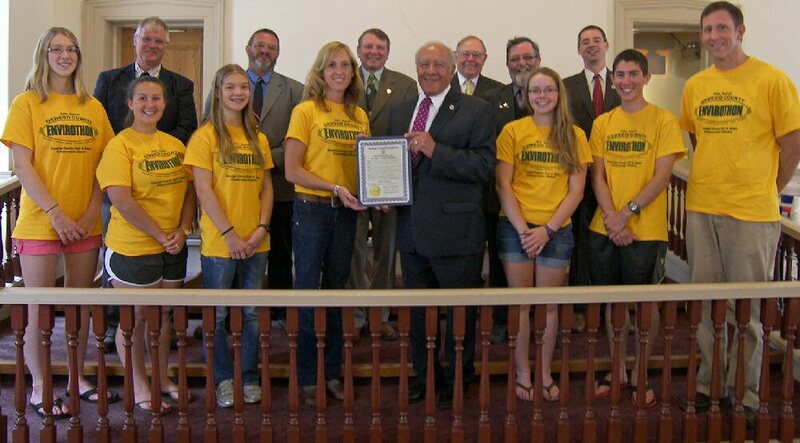 Pictured from left are Emma van der Heide; Jacqueline Novak; Ruthie van der Heide; Envirothon Coordinator Erica Schreiner, Oswego County Soil and Water Conservation District; Committee Chairman Morris Sorbello, District 23; Hannah Greulich; Randy Novak; and Team Advisor Jamie Hefti, biology teacher at the Pulaski High School. Pictured from left in the back row are legislators Richard Kline, District 12; Daniel LeClair, District 8; Roy E. Reehil, District 5; Milferd Potter, District 2; Douglas E. Malone, District 20; and Committee Vice Chairman Shawn Doyle, District 3.